1. Clear the path. Sweep the walkway to your front door. Remove lawn ornaments, including cords or garden hoses that can trip or harm trick-or-treaters. 2. Keep it bright. Turn on your porch light and other outside lights. Replace light bulbs that have burned out. A lighted porch is an invitation for trick-or-treaters to knock on your door and keeping your entry well-lit will make it safer for them. 3. Eliminate fire hazards. Avoid placing real candles in jack-o’-lanterns that can be tipped or blown over in the wind. Instead, use battery-operated candles or light sticks that can’t catch fire. 4. Keep pets locked up. 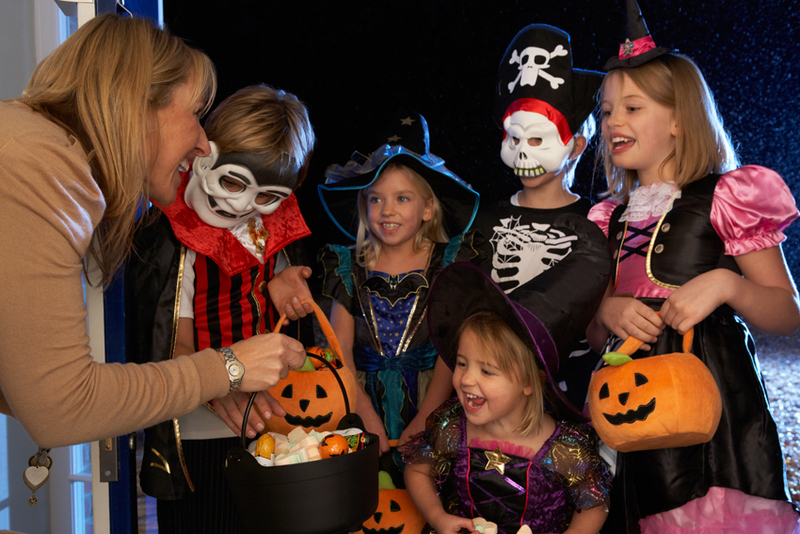 Even friendly pets can become a handful when costumed kids keep showing up at the door. And you never know what trick-or-treater might be allergic to cats or dogs. 5. Protect your family and home. Halloween is full of treats, but is also a prime time for harmful tricks, like vandalism and burglaries. Be sure to lock all doors and windows, secure your garage and bring in anything valuable equipment left outside. Never open your door if you feel unsure of the visitor. And lastly, turning off all outdoor lights when you are done providing treats for the night signals to the neighborhood that treat time is over.